Zucchini noodles make an excellent substitute for the wheat variety. Any time you can pack more veggies into your diet, more power to you. 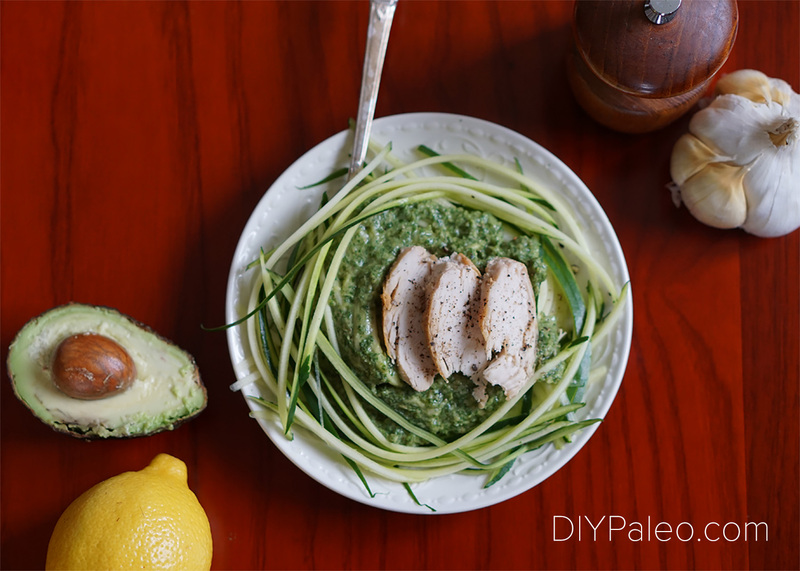 The sauce is really rich, but it’s loaded with healthy fats and even MORE veggies! You won’t miss the dairy. If you don’t have a julienne peeler, spiralizer or mandoline…sorry, you need to go get one. Be EXTREMELY careful while making your zoodles. I’ve cut myself on the mandoline at least 10 times and I’ve barely had the thing a year. I finally caved and got this nice julienne peeler on Amazon for about $10. And it even came with a ceramic knife. Winning. Julienne the zucchini into "noodles" using a julienne peeler, mandoline or spiralizer. Lightly salt and set aside. Halve avocado and remove the pit. Scoop out the inside and place in a food processor or blender. Add garlic, lemon, parsley, salt, basil, and 1/4 c. avocado oil. Blend until smooth. Heat 1 Tbsp. avocado oil in a pan. Add zucchini and sauce. Sautée 5 min. or until zucchini is just beginning to soften and sauce is warm. Serve with your protein of choice—chicken breast and shrimp are my favorites.